THE PENTAGON MAY soon be unleashing a 21st-century version of locusts on its adversaries after officials said this week it had successfully tested a swarm of 103 micro-drones. Military strategists have high hopes for such drone swarms that would be cheap to produce and able to overwhelm opponents’ defences with their great numbers. The test of the world’s largest micro-drone swarm in California in October included 103 Perdix micro-drones measuring around six inches launched from three F/A-18 Super Hornet fighter jets, the Pentagon said in a statement. 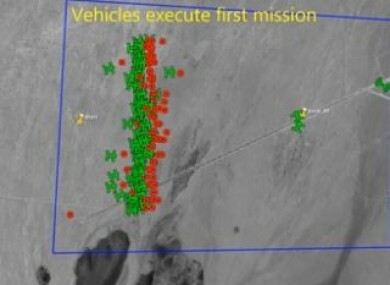 “The micro-drones demonstrated advanced swarm behaviours such as collective decision-making, adaptive formation flying and self-healing,” it said. “Perdix are not pre-programmed synchronised individuals, they are a collective organism, sharing one distributed brain for decision-making and adapting to each other like swarms in nature,” said William Roper, director of the Pentagon’s Strategic Capabilities Office. Because every Perdix communicates and collaborates with every other Perdix, the swarm has no leader and can gracefully adapt to drones entering or exiting the team. In an information leaflet, the Department of Defense said that the Perdix were first air-dropped in September 2014 at Edwards Air Force Base. In September 2015, they were also flown during an exercise in Alaska, taking part in ground and maritime surveillance missions. As SCO works transition to the Services, it is also partnering with the Defense Industrial Unit‐Experimental (DIUx) to find companies capable of rapidly building 1,000 units this year. SCO is also working on the “Gen 7” design, which will likely include more advanced autonomy. Email “The US could unleash micro-drones that move in swarms”. Feedback on “The US could unleash micro-drones that move in swarms”.